The mighty flow of blood and hope from Tunisia, Egypt, Yemen, Bahrein, Algeria and Lybia has also washed over young Palestinian minds in Gaza. What started as a stream has become a torrent and will soon spill its banks. Palestine’s 25 January will be 15 March. Palestinians are working hard to mobilize thousands of people to the squares of Ramallah and Gaza on the day which has been named “The Day of Reconciliation” rather than “The Day of Anger”. The lessons learned from the Egyptian Revolution have refreshed the pride of young Gazawi as Muslims and Christians from various social classes were able to drive out a powerful dictator who seemed to be nailed to his throne. They are ready to explode into a strong and rational demand for the “End of Division,” ie the end of the division between Fatah and Hamas. “We chose the 15 March because for us Palestinians, it is a day without political significance or special celebrations. The basis for our popular initiative is absolutely non political and independent from all political factions. We do not accept groups that even remotely identify with any party”, says 22 year old Assad. When I met up with Assad Saftawy, Shamallakh Mohammed, and Mohammed Al Sheikh at the Coffee Gallery in downtown Gaza City, the tension was so high, one could cut it with a knife. Shortly before I had arrived, the boys got an unwelcome visit from undercover Hamas police who seized their computers and cell phones. “Why are Hamas so afraid of you?” I ask them. “Although we have been clear from the very beginning that our intentions are for a call to heal the fracture between Ramallah and Gaza due to so much suffering, apparently they suspect that there is someone among us who is connected to “The Revolution of Honor”, Fatah’s day of anger initiated a few weeks ago but deserted by people in droves. Besides this, all Arab leaders fear the spontaneous demonstrations of young people. “The funny thing is that senior government officials here, such as the deputy of Hamas’ Ahmed Yousef, declared publicly that he was in support of our initiative”, said 22 year old Mohammed Al Sheikh. Anyone wishing to join the initiative for the movement on 15 March may have to contend with explicit threats from either the mukabarat in their dark uniforms or maybe a raid in a crowded coffee house by undercover Hamas security forces like the one today. The politics of double games wear two kinds of suits. “Do you think they have the same problems even in Ramallah?” I ask. 24 year old Mohammed Shamallakh responds: “Of course. And like us, they too are willing to go to jail. We will not hide. Feel free to write our real names. In front of the tv cameras politicians pay lip service to all their good intentions regarding a possible reconciliation, but we know that in reality, they are enjoying many privileges in this stalemate. Young people are tired of being at their windows, watching life pass before their very eyes. Because of the feud between Hamas and Fatah, I have lost three scholarships, the opportunity to travel, work and create a family. Every day that passes is like a year and I do not want to begin living at 40 or 50 years of age. If our leaders are so short-sighted as to not have control of the situation, understand the needs of the people, then on 15 March we will show them that it’s time to put aside internal disagreements and work together in order to end the siege and occupation “. 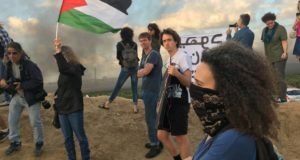 Not only are large numbers of youths expected to mobilize from the center of Gaza City and Manara Square in Ramallah, but also Palestinians in Israel, various European cities and the world are ready to hit the streets. I bring to Mohammed’s attention the problem of external interference in the choice of Palestinian leadership and the recent scandals brought to light by the publishing of the cables by Al Jazeera which show the close collaboration of PLO leasdership and Israel. I asked them what they recalled from 14 June, 2007, the bloody day in Gaza when Palestinians slaughtered Palestinians without any mercy at all. Their enthusiastic faces suddenly became bleak. Even though through the years, each of these three boys had lost friends and relatives at the hands of the Israelis, they all agreed in saying that day was the saddest day in recent Palestinian history. “There were snipers and gunfire everywhere throughout the Gaza Strip. 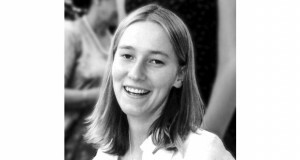 It was impossible to distinguish who was killing whom. Since then, our future has certainly been dead” says Assad Saftawy anguishly. Before offering them a shisha, I ask them about how their parents took to the initiative. Mohammed Shamallakh: “My father advised me to give up on the idea. You must know that I suffer from a particular situation: in Ramallah they are convinced that I am a militant from Hamas. In Gaza, that I belong to Fatah. But I do not side with one or the other and the initiative of 15 March will not be manipulated by anyone. We are only asking in a loud and strong voice for the end of the divisions”. Assad: “I’m slowly convincing my father, in the meantime my brothers and my sisters have already sided with me”. As the smoke rises from the arghile and begins to brood over our heads, I get the distinct feeling that Mohammed’s parents are probably not wrong. 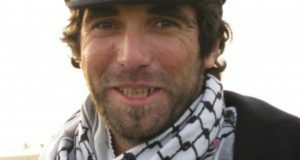 Vittorio Arrigoni has lived in Gaza City since 2008. A freelance journalist, peace activist and Italian member of the ISM (International Solidarity Movement), He writes predominately for the newspaper Il Manifesto. He is the author of Gaza Stay Human (Gaza. Restiamo umani) and blogs at: http://guerrillaradio.iobloggo.com.